Franklin County is a county in the northern part of the U.S. state of New York. It borders the Canadian provinces of Quebec and Ontario. As of the 2010 census, the county population was 51,599. Its county seat is Malone. The county is named in honor of United States Founding Father Benjamin Franklin. 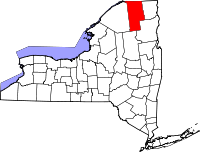 Franklin County comprises the Malone, NY Micropolitan Statistical Area. Much of Franklin County is within Adirondack Park. When counties were established by the English colonial government in New York in 1683, the present Franklin County was part of Albany County. This was an enormous county, including the northern part of New York State as well as all of the present State of Vermont and, in theory, extending westward to the Pacific Ocean. This county was reduced in size on July 3, 1766 by the creation of Cumberland County, and further on March 16, 1770 by the creation of Gloucester County, both containing territory now in Vermont. On March 12, 1772, what was left of Albany County was split into three parts, one remaining under the name Albany County. One of the other pieces, Charlotte County, contained the eastern portion. In 1788, Clinton County was split off from Washington County. It comprised a much larger area than the present Clinton County, including several other counties or county parts of the present New York State. Following the American Revolutionary War, the United States forced the Six Nations of the Haudenosaunee, or Iroquois Confederacy, to cede most of their lands in New York and Pennsylvania. Most of the nations had sided with Great Britain in the war. After the war, New York State sold off 5 million acres of former Iroquois territory at low-cost prices, seeking to attract settlers to develop farms and businesses. Land speculators quickly took advantage of the sales. Franklin County is part of the huge speculative Macomb's Purchase of 1791. In 1808, Franklin County was split off from Clinton County and organized. It was named after United States Founding Father Benjamin Franklin. In the late 1880s and 1890s, both the Delaware and Hudson and New York Central railroads were constructed into the Town of Franklin. The Chateaugay branch of the Delaware and Hudson served the hamlet of Onchiota, which developed for the lumber industry. For more than 12 years a major tract north of Saranac Lake was harvested and millions of feet of timber were shipped out from here. The railroads carried the timber and products to market, and the industry flourished into the early 20th century until much of the timber was harvested. Several lumber mills operated in this area for decades, including Kinsley Lumber Company, Baker Brothers Lumber Company, and one owned by the Dock and Coal Company. The latter mill was dismantled in 1917 and shipped to Florida to be used in the lumber industry there. The population declined as the lumber industry pulled out of the area. The railroads also contributed to the Town of Franklin becoming a destination for summer travelers. In the late 1800s, Franklin County was home to three of the largest resort hotels in the Adirondacks: Paul Smith's Hotel, Loon Lake House, and Rainbow Inn. Due to the construction of highways and restructuring in the railroad industry, passenger service was ended to this remote area in the mid-20th century. Ray Fadden (Mohawk), with his wife Christine and son John, was the founder and curator of the Six Nations Indian Museum located in Onchiota, a census-designated place in the Town of Franklin. He built the structure from logs he had milled himself. The family-owned museum features more than 3,000 artifacts primarily from the Iroquoian nations, and interprets their culture. They were a prominent confederacy in New York of Six Nations by 1722, and they controlled much of the state west of colonial settlements at Albany and Schenectady. According to the U.S. Census Bureau, the county has a total area of 1,697 square miles (4,400 km2), of which 1,629 square miles (4,220 km2) is land and 68 square miles (180 km2) (4.0%) is water. It is the fourth-largest county in New York by land area. Franklin County is in the northeastern part of New York State. The northern edge borders Quebec and Ontario provinces of Canada. The Upper, Middle and Lower Saranac lakes are located within the county. These are part of the natural resource attractions in the area. Lower Saranac Lake extends into neighboring Essex County to the southeast. Loon Lake is also located in the county, as is its namesake community. The area has no public transportation but roads extend through the county. It has not been served by railroad passenger service since 1957. St. Regis Mohawk Reservation is international, extending across the border into Quebec, Canada. Also known as the Akwesasne reserve, the community was founded in the mid-1700s, when all the territory was part of New France. Citizens of Akwesasne have rights for free passage across the border. Franklin County commonly voted Republican for presidential candidates until the election of Bill Clinton in 1992. Clinton carried the county by a 5-point margin in 1992, and increased his lead in 1996 with a more than 20-point victory. The county voted solidly Democrat for the next several elections, most notably in 2012 when Barack Obama carried the county by 26%. Franklin County swung back Republican by a somewhat thin margin in 2016, when Donald Trump won the county by fewer than 1,000 votes. ^ "The Six Nations Indian Museum: Mohawk Oneida Onondaga Cayuga Seneca & Tuscarora Indians. Artifacts emphasis on the culture of the Six Nations of the Iroquois Confederacy". www.sixnationsindianmuseum.com. Archived from the original on 2018-01-08. ^ "Counties Population Totals Tables: 2010-2016, Annual Estimates of the Resident Population for Counties: April 1, 2010 to July 1, 2016". Archived from the original on September 15, 2017. Retrieved June 10, 2017. ^ "Historical Census Browser". University of Virginia Library. Archived from the original on August 16, 2012. Retrieved January 4, 2015. ^ "Population of Counties by Decennial Census: 1900 to 1990". United States Census Bureau. Archived from the original on February 19, 2015. Retrieved January 4, 2015. ^ "Census 2000 PHC-T-4. Ranking Tables for Counties: 1990 and 2000" (PDF). United States Census Bureau. Archived (PDF) from the original on December 18, 2014. Retrieved January 4, 2015. ^ Franklin County Public and Private Airports, New York Archived 2011-10-19 at the Wayback Machine. Retrieved June 13, 2013. ^ "BEAMAN, Fernando Cortez, (1814 - 1882)". Biographical Directory of the United States Congress. Archived from the original on February 25, 2014. Retrieved February 23, 2014. Wikimedia Commons has media related to Franklin County, New York.